New Mazda CX-3 defies its dimensions, packing even more style, value and power into the small SUV�s latest update. 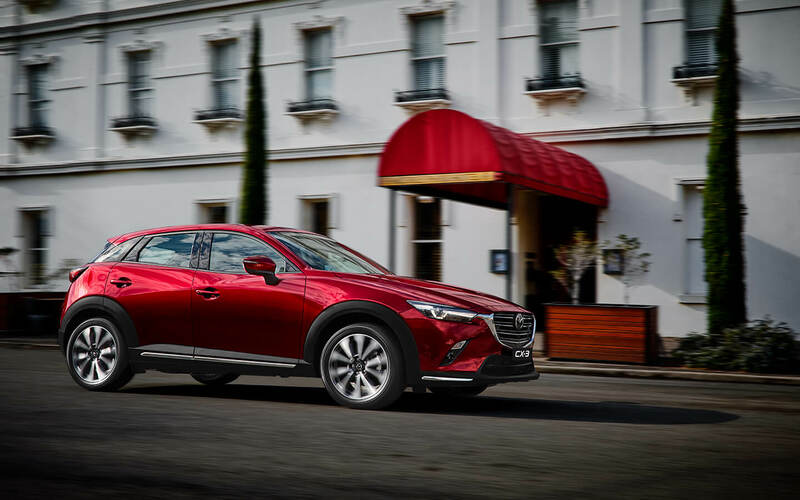 Released in Australia at the end of August, New Mazda CX-3 has seen a design, equipment and engine upgrade to enhance its timeless appeal and the elements that make it one of the most popular small SUVs in the segment. On the exterior, a new front grille adopts bold horizontal lines to achieve a more assertive stance, while rear combination lamps on sTouring and Akari models have been refined to give a more premium and precise look. Inside, New Mazda CX-3 has been given a substantial makeover with a revised centre console design accommodating the newly added Electric Parking Brake (EPB), now standard on all grades, as well as, a newly padded armrest. New high-quality materials have been adopted for the front seat cushions to give greater ride comfort, and seat upholstery has been changed to full leather on the high-grade models. Boosting safety, a reverse camera is now standard across all grades, joining a comprehensive suite of standard i-ACTIVSENSE advanced safety technologies to support the driver, including Smart City Brake Support Forward and Reverse (SCBS F/R) and Emergency Brake Assistance (EBA). The range-topping Akari also adds Mazda�s new 360� View Monitor and Mazda Radar Cruise Control (MRCC) with Stop & Go - the only vehicle in its category to offer both functions. Further still, sTouring and Akari grades adopt newly designed, bigger, 18-inch wheels with a bright metallic finish that better absorb high-frequency road noise and vibration. Dynamics have been further advanced with suspension Electric Power Steering (EPS) revisions. New Mazda CX-3 is available with the SKYACTIV-G 2.0L petrol engine, which has seen a range of SKYACTIV technologies applied to improve the economy, while also improving the engine�s power and torque performance. The new SKYACTIV-D 1.8L turbo-diesel engine is also offered with more power, replacing the smaller capacity 1.5L engine in the previous model. Combined with a host of SKYACTIV technology upgrades, including SKYACTIV-Vehicle Dynamics enhancing the Jinba-ittai driving experience, the new engine boosts power to 85kW at 4,000rpm, while torque remains a high 270Nm. New Mazda CX-3 is available in four model grades, with Neo and Maxx variants upgraded to Neo Sport and Maxx Sport to sit alongside sTouring and the top-spec Akari models. New Mazda CX-3 is available in both front-wheel-drive and all-wheel-drive guises with either the 6-speed SKYACTIV-MT manual or 6-speed SKYACTIV-Drive automatic transmission. New Mazda CX-3 is available in a choice of eight colours, matched with five model-dependent interior colour schemes.